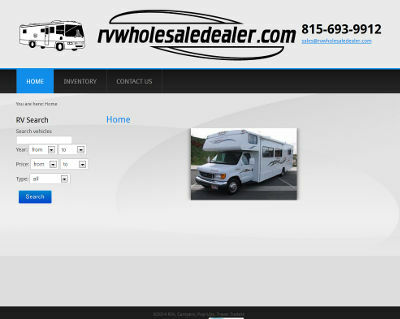 Shortly after completing the logo design for RV Wholesale Dealer, we got to work right away with the website. The customer specifically wanted something very clean and un-cluttered. The website will be used to market and advertise recreational vehicles and travel trailers at good rates, so they needed to have our vehicle listings software. Our vehicle listing software is used for any kind of dealership website – car dealership websites, rv dealership websites, or any others that require the ability to post any kind of vehicle for sale. The customer also requested that a search feature be available so visitors could quickly search for what they were looking for from the home page. Between this and a slideshow of some RV vehicles, this is all that was put on the home page. The Inventory page lists the various categories of items that they are advertising. We appreciate the business from RV Wholesale Dealer! Their website is at rvwholesaledealer.com.